Despite a sea of pink draping Colorado in October, fundraising for Komen breast cancer affiliates is down by as much as 30 percent, a drop that will hit local nonprofits across the state. Employees at Komen affiliates in Colorado risked their jobs in February when they publicly opposed the national move of Susan G. Komen for the Cure to cut funding to Planned Parenthood. The political spat between the two womens health groups erupted after Komen officials withdrew $680,000 from Planned Parenthood, which along with abortions and contraceptives, provides breast cancer screening to the poor. The flap resulted in such outrage nationally that Komen ultimately reversed its decision. Resignations, recriminations and a tell-all book have since followed. While the politics of womens health play out nationally in the presidential race and beyond, reverberations from the Komen controversy are hitting local groups in Colorado now and will filter down to nonprofits in coming months. At Komen of Southeastern Colorado, which serves El Paso, Teller and Pueblo Counties, Race for the Cure participation and proceeds were both down. The race took place on Sept. 9 at Garden of the Gods in Colorado Springs. It drew 5,400 participants who raised about $280,000, a 30 percent decline from the 2011 race. The race is by far the largest fund-raiser of the year for the southeastern Colorado affiliate. There was one silver lining in that individuals who participated in the race each raised 6 percent more funds this year than individuals have in the past. But anger over the Planned Parenthood fight combined with the poor economy mean that the Colorado Komen group will give out fewer dollars next year. Komen made a dumb mistake and hopefully that mistake wont ever be made again, said Paul Montville, executive director of the southeastern Colorado Komen affiliate. That being said, you can be mad at us, but dont be mad at the women we serve. We do good work. Dont withhold support from the women who need our help. In my wildest dreams, we couldnt grant enough money for all the women who need it. The largest Komen affiliate in the state and one of the top-grossing affiliates in the nation, the Denver metropolitan group also saw its Race for the Cure proceeds and participation decline about 20 percent this year. This years Race for the Cure, the largest fundraiser of the year for the Denver affiliate, took place on Oct. 7, attracted more than 40,000 people and brought in about $2.4 million in revenues. Attendance has been declining throughout the recession since its peak in 2006 when more than 60,000 people participated. The Denver Metropolitan Komen affiliate serves a far larger area than its name implies, including 19 counties that stretch into the mountains and across the eastern plains. We know that our grant funds will go down this year, said Michele Ostrander, executive director for the Denver affiliate. Because of that, our board has had to make some strategic decisions. Ostrander said Komen Denver will fund basic needs including breast cancer screening and community health navigators who can help women find care. For 2013, she said her group will not be able to fund excellent support programs including groups that provide non-medical services such as meals, transportation and housing support for low-income people with breast cancer. 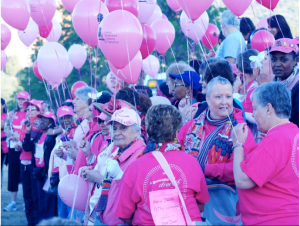 Women gather in Colorado Springs at the Race for the Cure in September. Fund-raising for Komen affiliates across the country is down as local groups try to rebound from the national organizations flap with Planned Parenthood. Ostrander and her board released a letter in February decrying the Planned Parenthood decision and have always maintained local funding for Planned Parenthood clinics. Nonetheless, the Denver group finds itself having to beg for forgiveness and renewed support here in Colorado. Youre helping your friends, your neighbors who dont have access to care, Ostrander said. Komen Denver saves lives in our community. We cant do that without the support of the community. We hope that if folks are still angry about the flap between national and Planned Parenthood that they will forgive us because lives are depending on it. Ostrander thinks that message may be reaching some of the biggest donors. Both attendance and revenues were up at the Denver groups Pink Tie Affair, which took place on Oct. 27 in Denver. The event grew about 9 percent to 960 people, up from 840 last year and generated revenues of about $420,000. The Pink Tie Affair attracts a more well-heeled crowd, while Race for the Cure reaches the masses. Better results at the fancy affair may mean that the economy is improving for upper income people while middle- and low-income people may still be struggling. Many of the donations to Race for the Cure can be as small as $10 or $25. If a family is struggling, then that is more likely to be affected by the ongoing problems with the economy, Ostrander said. Representatives from Colorados Komen affiliate in Aspen declined to comment, but in an August letter to the Aspen Times, Komen board member Nancy Pickard said donations were down 20 percent and pleaded with community members to support the local group. We live here. We save lives here, Pickard wrote, saying she was addressing those who were not participating in Komen events to retaliate against the national groups actions against Planned Parenthood. I support your feelings and was very upset as well that Komen took such a politically motivated step that only served to hurt the women we serve. Please remember, however, that Komen Aspen not only had nothing to do with the decision, but the moment we heard about it, we immediately (opposed it). The Colorado affiliates have always maintained their ties with Planned Parenthood. But they are not alone in feeling repercussions from the controversy. Ostrander said shes heard from fellow affiliate directors across the country that revenues are down 15 to 30 percent. Funds raised in Colorado do not support administrative costs at the national Komen office in Texas. Rather, 25 percent of funds go to research while the rest stay in the local community to fund early detection of breast cancer. Paul Montville of the southeastern affiliate said its a shame that the group that perfected marketing for a cause is now suffering because of poor decisions at the top. We had 5,400 people show up (at our race) in what is arguably the toughest year weve ever had. It will be a tough grant year, he said. But, he is trying to move forward, tapping the enthusiasm of dedicated people on the ground in Colorado. The race is about more than paying your $30, getting a T-shirt and having a fun morning in Garden of the Gods. People are showing solidarity and were trying to ask them to ask 10 friends for $10 each. That money goes right to our bottom line. We give it away for mammograms and treatment support, Montville said. Theres nothing even in second place for us, he said of the Race for the Cure. The race is us and we are the race.